My primary research interests lie in the interactions which took place in the public sphere of early nineteenth-century Britain. The first forty years of that century were incredibly dynamic as the country shifted to modernity at a rapid pace. Empire was expanding, the railways were coming and life in many communities was changing forever. My PhD focusses on one particular piece of government legislation, the Municipal Reform Act (1835) and its impact on Birmingham. I want to understand how the interactions between public and authority shaped legislation during this so-called ‘Age of Reform’ and this is only possible through a careful analysis of contemporary dialogue. This dialogue, which I refer to as ‘a field of negotiation’, can be observed in many forms, but by far the most interesting is the various ways in which print was utilised to facilitate this engagement. Examples of this have included simple printed notices in shop windows, placards on church doors and the walls of the town hall and cheap penny pamphlets. The Birmingham Political Union was the leading political institution in the town for almost a decade and there remains a useful collection of printed ephemera relating to their activities in the Library of Birmingham archives. 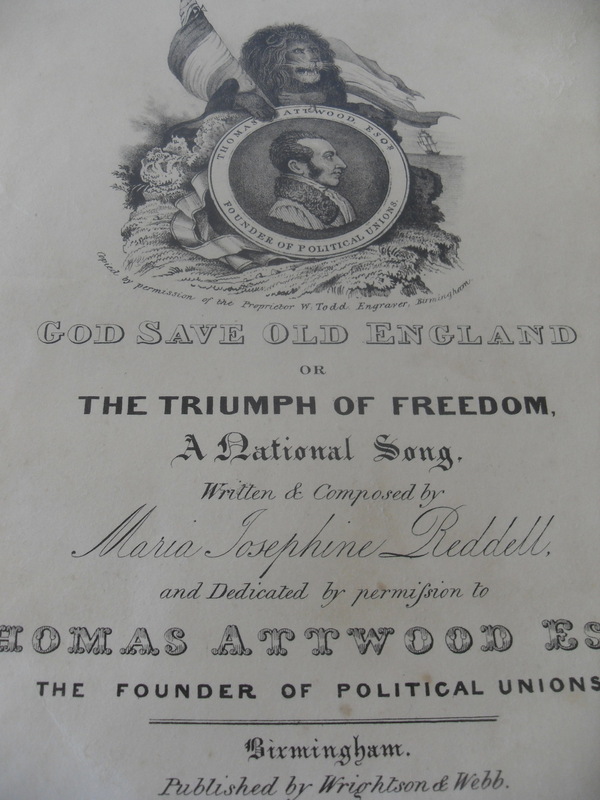 This includes copies of sheet music and verse for various ‘hymns’ of the Union and posters, along with a couple of cartoons. Although much of the material from this period has been lost, it is possible to find reference to it in a variety of sources, including court documents and reports of government investigations, revealing in itself of the contemporary impact and importance of printed material (however temporary it was intended to be) during that time of great social change. The role of the printer was a crucial one and I am looking forward to finding out more about the politics of printing as my research develops.